Limelight hydrangeas are a hydrangea cultivar that blooms later than most other varieties; the grace the garden from mid-summer through the fall, providing late season color. Their large, panicle shaped blooms start out as a lime green, morphing into a creamy, champagne white and then turn to a deep pink as autumn approaches. The idea of growing hydrangeas can be daunting for some gardeners because of their need for acidic soil. While homeowners yearn for the big, beautiful blooms the shrubs produce they can be turned off by needing to amend their garden soils to keep the pH at the appropriate level. What many don't know though, is that limelight hydrangeas do not require acidic soil, making them an easier gardening option. Like other flowering ornamentals, you want to find a spot that gets plenty of sunlight to promote good growth. Limelight hydrangeas will do best if you can find a nice spot in the yard or garden where they can get 6-8 hours of sunlight during the day, with some shade in the afternoon. Their large, showy blooms like to have some time to cool down during the hottest part of the day and won't droop or wilt like they would if planted in a spot that has full sun, all day long. Hydrangeas like to grow in loamy, well-drained soil. Before planting amend the growing spot well with finished compost or other organic matter to improve the soil structure, helping to create a lighter soil with good porosity. For tips on adding compost to your garden soil, check out Compost Guide. Limelight hydrangeas can get quite large, growing up to 8' in height and almost the same size width-wise. When determining placement in the garden -- and then digging planting holes -- it's important to keep this in mind. You can plant closer together if you intend to keep shrubs pruned to a smaller size but if you'd like them to grow to their full size they will need plenty of room. While the root system is establishing, it's important to keep your plant well watered. Keep the soil moist by providing plants 1-2" of water a week, slightly more if you live in a hotter, dry climate. Once the plant has matured you can scale back slightly and water when the soil becomes dry. As your hydrangeas begin to grow in the spring apply a slow-release fertilizer designed for shrubs according to the label recommendations. This will provide season-long nutrients and promote both vegetative growth and abundant, showy blossoms. 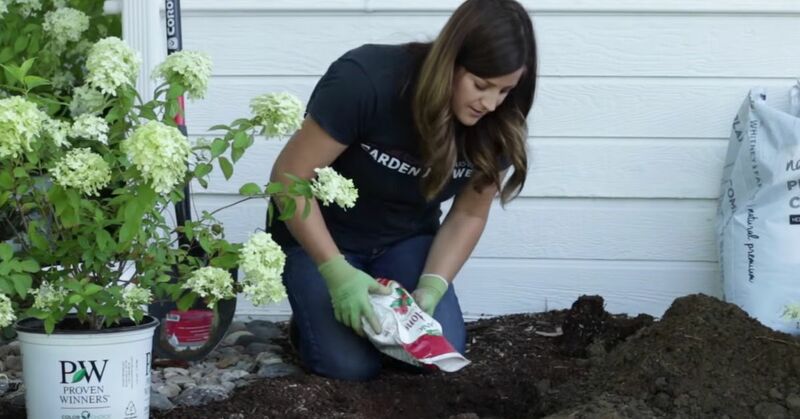 In the fall after blooms have faded, or early in the spring before plants break dormancy, cut back the hydrangeas between one-third and one-half. Buds will form on the new growth that occurs in the spring. Pruning also helps to keep plants from getting too large for their space and maintaining a nice "shape".